These pepparkakor (thin Swedish ginger cookies) are whole wheat and dairy-free and just as crisp and delicious as the more traditional kind! 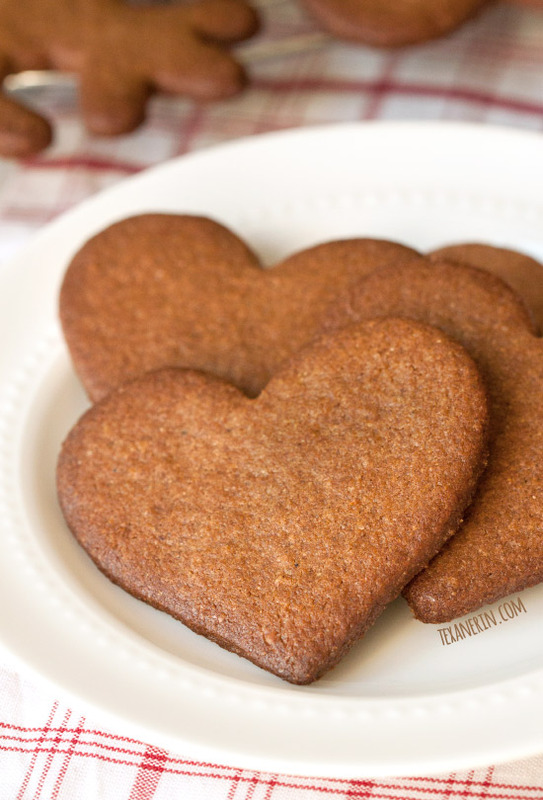 Have you ever tried Anna’s Ginger Thins or the heart-shaped ginger cookies at IKEA? These pepparkakor cookies are just like those, but better! They’re thin, crisp and have lots of gingerbread spice. And cardamom! I don’t think I had ever had cardamom in anything before I did my first exchange year in Sweden, where cardamom is really popular. Now that I’ve tried it, I enjoy it in most of my gingerbread-like treats. And my other Swedish treats, like this Swedish apple pie, which is actually more like a crisp and super delicious. I also added a tiny bit to my Swedish blueberry soup! Pepparkakor (Swedish for “pepper cookies”) are enormously popular in Sweden and the rest of Scandinavia during the holidays. They’re relatively simple to make and don’t require any frosting or other decoration. And they come with an interesting history! 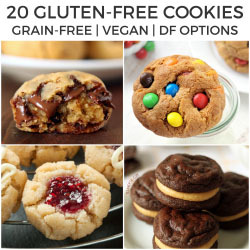 The cookies pictured above are the dairy-free version made with coconut oil. I thought I’d try them with butter, just in case someone asked about using it, and you can see the difference below. But the thing is, I used 1.4 more tablespoons of butter, as I often need a little less coconut oil than butter when baking certain treats. So instead of 2/3 cup, I used 3/4 cup. That was definitely too much. If you want to use butter, I recommend 11 tablespoons. Or even 2/3 cup! They came out delicious and perfectly crisp with 3/4 cup butter, but they spread quite a bit. I made my first few batches with sugar beet syrup, which is similar to regular molasses. Then I made it with blackstrap molasses and for the first time ever, I have to recommend not using blackstrap. It totally overpowered the spices. Stick with regular molasses here! Something I really love about this pepparkakor recipe is that the cookies stay fresh for a long time. I wrote one month in the the recipe, just to be safe, but in reality I’m pretty sure they last much longer (based off of past experience with pepparkakor). And the dough is pretty easy to work with and bake! I made some intricate snowflakes and was worried about the edges burning before the center had browned, but they came out perfectly. I made the moose in this cookie cutter set and that was the only one I had issues with, probably because it’s so big. Instead of using a spatula to remove the moose to another baking sheet, I just peeled away the dough around the cookie cutter and baked the moose on the parchment paper I had rolled it out on. Want more Swedish cookies? Try these Crispy Swedish Cardamom Cookies from The Food Charalatan! These Swedish Heirloom Cookies from Shugary Sweets also look awesome. In a large mixing bowl, stir together all the dry ingredients (flour through salt). Using a stand mixer or an electric hand mixer, beat together coconut oil, granulated sugar and brown sugar until thoroughly combined. Add the molasses and vanilla and beat until combined. Beat in the egg. Add the dry mixture all at once and beat until well combined. It'll be very crumbly and dry. Use your hands to combine it and bring it together into a dough. Form into a disc and wrap with plastic wrap. Refrigerate for at least 2 hours or until very firm. Place 1/4 of the dough onto the center of a piece of parchment paper. Cover with another piece of parchment paper and roll to 1/8" thickness. Try to keep it as even as possible so that the cookies bake evenly. The dough shouldn't stick at all to the parchment paper. If you see that it is, gather the dough back together and lightly flour the surface before rolling out again. The dough will be very firm and will take quite a bit of effort to roll out – if it's too firm, let it sit for 10 minutes or until softened just a little. Cut out shapes using whatever cookie cutters you like and place on a parchment lined baking sheet. Bake for 7-10 minutes or until evenly and lightly browned. It's difficult to give an exact time as it depends on the size and shape of your cookie cutters. The cookies may be soft when you remove them from the oven, but after cooling for a few minutes, they should be totally crisp. If they're soft after they've cooled, you can put them back in the oven for a few more minutes. You may want to make just a few the first time as a trial. I used refined coconut oil and these cookies had absolutely no coconut taste. If you use unrefined coconut oil, these will likely have a coconut flavor. 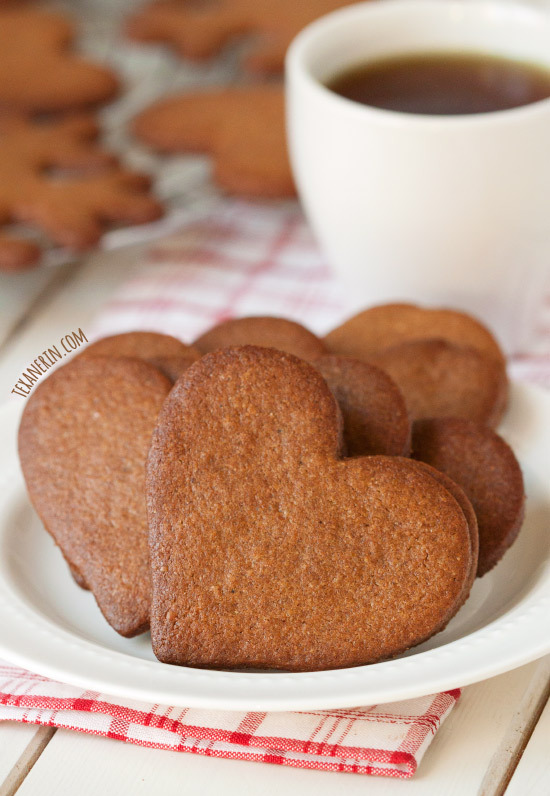 56 comments on “Pepparkakor Recipe (Swedish Ginger Cookies)” — Add one! Dear Erin, Thanks for sharing this recipe. I love this cookie. However I prefer not to use the quantity of sugars in it, since I avoid sugars.My question is, can I just use 2/3 cup Splenda/Stevia instead of using all those sugars and molasses? Or simply use coconut sugar and Splenda/Stevia? Thanks in advance for your reply. Hi! Sorry for just now seeing your question. I don’t really have any experience with sugar-free sweeteners (they give me issues) so I really can’t say. I’m sorry that I can’t be more helpful! I’m not really hopeful about sugar subs in this recipe because it’s a crunchy cookie and the sweeteners are very important to get the right texture. Can I replace another flour for the whole wheat? Like all purpose or a coconut or rice flour? AP flour would probably work (though I haven’t tried it). Coconut flour or rice flour definitely wouldn’t. Wow, these cookies are soo good. I didn’t have cardamon, so I added a little more cinnamon. Sooo good. I rolled some thin – loved how crispy they turned out, and some thicker – for a nice chew. Very very good. Thank you for all your healthier recipes. You’re welcome! And thank you for your nice comment. :) I’m so happy that they came out well for you! You’ve got to try them next time with cardamom. It adds such a nice taste! I have never made pepparkakor, which is such a crime! I need to try this out stat!! Love your recipes that have Gluten Free options, as I must eat GF for life. Do you think these would work with a GF flour mix? Would there be any other adjustments in ingredients to make them GF? Thank you for your wonderful GF included recipes! It is very appreciated. I share a lot of your GF recipes with my gluten free community on our Facebook page! And I very much appreciate you sharing my recipes. :) Thanks so much! My other half is swedish and we live in Berlin, German:-). 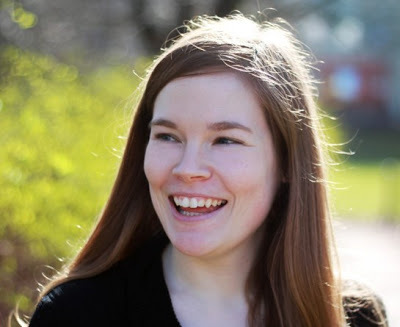 Last summer we visited a friend in Sweden and when we had fika (familiar term?) she found 3 left over peperkakor from christmas time in her cookie tin. And they were still good! As if they had been baked the day before. Haha. Yeah. Those get spit out! These are great! 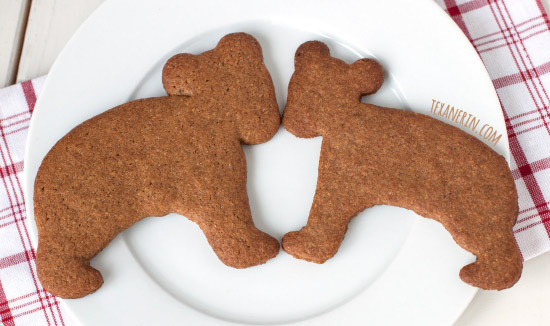 Are those little bear shaped cookies? I love them! These look perfect for our holiday cookie exchange. Love cutouts and these sound delicious. Oh, yummy! I can’t wait for some ginger cookies and gingerbread this holiday season! These look great. I wonder why they last so long. They’d be perfect to take on a hiking trip or ship in the mail overseas. Simple cookies like these are my FAVORITE kind of cookies. These cookies get me in the baking spirit for the holidays. I can just smell their spicy goodness through the screen! These look fantastic…love the comparison you did with butter. I need to use more coconut oil! I love these type of cookies, they look great! Did you use an equal amount of the sugar beet syrup? I bought some last year before I found molasses at the American/Brit store and have been wondering what to do with it. And seeing how it is cheaper, I would love to use it up for this recipe. I’m going to try it with a vegan ‘egg’ replacement so I’ll let you know how they turn out. I agree with King Hans’ physician–pepparkakor certainly cures a foul temper. They’re definitely in my top 5 favorite cookies. I swear that pepparkakor stays fresh for months on end! Aren’t they great? They look so boring but they’re so addictive! These are so wicked cool Erin. I love ginger cookies and the idea that they stay fresh so long is appealing. Particularly if one wanted to trim the tree with them. Love this recipe so much. Oh, yes! People do that with pepparkakor but I forgot to write about that in the post. I miss Ikea!! I *just* ordered this cookie cutter set on Amazon the other day (for, like, three times as much as it would cost in store!) I want the Moose, BAD!! I’ll be making Moose cookies this year ;) Your ginger cookies look fantastic – your recipe sounds easy breezy, I’d love to try these!! Cardamom is such an under-utilized spice…maybe because it’s so expensive? In the states, anyway. Regardless, I love it. And I love these cookies! These look good. I am more for a thick and chewy cookie myself. I made whole wheat gingerbread cookies last week with the help of a almost 3 year old. HA!!! She had fun!! Is it just me, or is the oven degree missing from this recipe? I’ve scanned it twice, but still don’t see it. Sorry about that! It’s 350F. Will fix the post when I get home. Thanks for pointing it out! So, magical ginger health cookies? I’m on board. I’m so intrigued by sugar beet syrup — hope I can find and try that! I suffer through the disgusting smell of freshly harvested sugar beets (seriously, they’re rank) so I deserve to try all of their sugary goodness, I think! Even though I really don’t bake any more, I’m saving this recipe. It reminds me of some German cookies my mother used to put in our Christmas stockings when I was a child. The flavor will probably be somewhat different because of the coconut oil, but they sound delicious, and I can almost taste them now… These are a real temptation, even more than chocolate! Are you thinking of spekulatius? These are kind of similar. :) And the taste is exactly the same when you use refined coconut oil (which I know a lot of people won’t want to do, but it’s what I use).